Today is a good day to create a few Halloween Cards with Diamond Press and the Halloween Stamp and Die Set! Diamond Press products makes creating easy to create with! 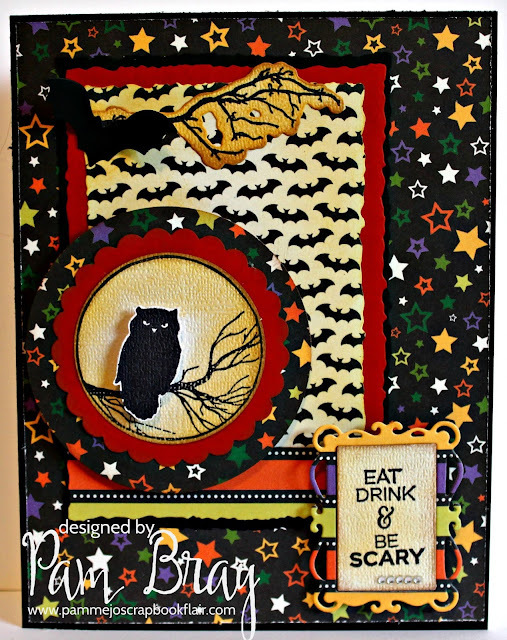 Cover your card base with Halloween paper. Add die cut frames to top of card. Stamp the image from Diamond Press Halloween Stamp and Die Set. Die cut stamped image with die. Ink edges with brown ink; adhere to top of card. Die cut bat from black card stock; add to front of card. Stamp owl with black ink from the Diamond Press Halloween Stamp and Die Set to cream card stock. Die cut stamped piece with die; ink edges with brown ink. Add stamped image to orange scallop circle and pattern paper circle. Stamp sentiment to cream card stock with black ink. Finish frame with clear gemstones.